Who doesn't love a DJ that drives while mixing. Parties love the Mobile DJ. A fully-mobile roving DJ unit with a sleek, classic automobile chassis, including real working headlights, twists and turns through the room as the DJ plays any number of musical styles or guest requests. This one-of-a-kind vehicle is equipped with a 1,000-watt source sound system that easily interfaces with any house or rented PA. The Mobile DJ Unit also features additional instrumentation, including Theremin, Keytar, and scratch pads. 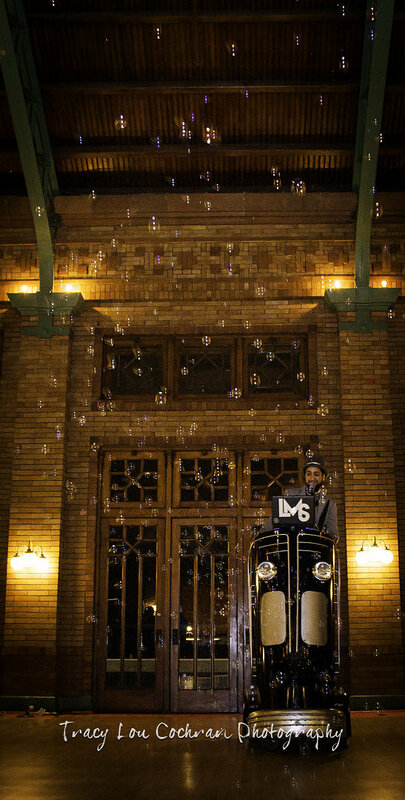 The finishing touch is an on-board bubble machine that leaves fields of delicate bubbles in its wake.